It is always scary to go on adventure in an unfamiliar place. The differences in culture, transportation, language, food or even how not to eat a gum will inevitably cause stress to most, if not all, of us. This will be quite different from Great Britain as this will mainly focus on cramming all tourist visits in a mere ¾-day vacation. I’ve mentioned from my previous posts that we also visited Malaysia, however, I don’t want to label this post as Singapore & Malaysia since we haven’t really toured around proper Malaysia. Someday, maybe… definitely! The mode of transportation around Singapore is relatively easy. If you’re familiar with smart phones and can easily navigate through that then you’re all set to wander the streets of the Lion City. I’ve used 2 main smart phone applications or colloquially apps during the whole trip. It’s GoThere SG and SG Buses. GoThere has a lite version here and a full paid version which you can download here. I used the lite version as it allows you to experience the full version for free for 14 days which I think is more than enough for quick travels. If you happen to visit Singapore beyond those number of days, you can always pay or use your phone’s browser and access gothere.sg which basically gives you the needed services. GoThere is your initial go-to map if you want to know which buses or trains to take from one place to another. Now that you know which bus to take, let’s go to our next app SG Buses to track down our bus. (Left) SG Buses V3 as seen in the App Store; (Step 1: Center) Open SG Buses, there will be 5 options at the bottom but since we’ve figured out from the previous app which bus to take, directly search 167 in the search bar; (Step 2: Right) This screengrab shows you the routes Bus 167 takes, you need to pick one from them and find the bus stop indicated from the previous app which is Victoria Concert Hall 02011. If you select the first route, you won’t find the bus stop 02011, if this happens, change routes, select the second one and find the bus stop 02011. (Step 3) Once you find the exact bus stop which is Victoria Concert Hall 02011, tap the black box beside it and this will show you the minutes it will take for the bus to arrive at your bus stop. The gif above shows how it went from 3 minutes, to Arrival. (Step 4) You need to remember how many stops later and the name of the bus stop you need to alight at. In this example, it was indicated to be 5 stops later at Winsland House, scroll down the 167 route and you’ll find Winsland House as seen below. (Step 5) You can see that there are two Arr at the moment, it only means that there is a bus 167 in Victoria Concert Hall (which is where we are from) and another one in Winsland House. If you keep tapping the black boxes beside each stops that you’re going to go through, it will let you keep track of where you are. If you keep on tapping on Capitol Bldg after you’ve left Victoria Concert Hall, you’ll see that the minutes will lessen and it will eventually be marked as Arr. If this is too exhausting for you, you can always look outside your bus and be mindful of the bus stops that you’ve stopped at, in this case, keep track of stop 04111, 04121, 08041, 08031 and 08111 which is where you’ll alight. These bus stop numbers are written below the bus stop names as seen in the photo above. They’re almost always in a very conspicuous place so it won’t be that hard. It is also important to note that you must press the stop button inside the bus with an appropriate amount of time before your bus stop to make sure that the bus driver will stop at your destination. Taking our example, right after the bus leaves the Dhoby Ghaut Stn 08031, press the stop button so you’ll have a guaranteed stop at Winsland House 08111. This is their bus etiquette and must be followed at all times or else you’ll miss your stop and the driver might get annoyed at you for suddenly pressing the stop button just seconds away from your destination. This also allows the driver to properly stop and not collide with other vehicles in other lanes. The train system in Singapore is very similar to the London Underground but a little less congested. You can see the Singapore train lines’ map here. You need to familiarise and differentiate colors and codes of the routes you’re aiming for but there will always be a helpful map within the stations so you don’t need to fret about apps and getting lost. It’s quite easier than the bus services because there will be announcements and visual representations of the train stops inside the train. The trains will also stop at each station so there’s no need to go crazy over the stop button because there’s none. You only need to know FROM which station and TO which station and their respective color and codes. From our Merlion Park – Orchard Plaza example above, we need to walk to Raffles Place Station (NS26 on the map), take the North South Line (Red on the map and on signs around the station) and alight at Somerset Station (NS23). You must also take into consideration which direction the train is going to, there are signages around the station which will indicate the train station name, code and an arrow accompanied by the name of the last station of that particular route. If you are in Raffles Place Station (NS26) and you’re going to NS23, make sure you board the North South Line with an arrow going to Jurong East (NS1) since that is the direction you want to go through. Jurong East is the last station of the North South line starting from Marina Bay. Phew, were you just reading random noises or did that actually make sense? Haha I’m starting to confuse myself as well. But, please refer to the map all the time so you can understand what I’m babbling about. Singapore has this universal card for both buses and trains called EZ Link. You can EZ-ly find them at ticket offices or 7-eleven. They’ve also started a Rent-a-Card scheme as explained thoroughly here. For your own convenience, this is highly recommended so you won’t have to count unfamiliar coins every time you commute. For 3-4 days, 20 SGD is enough. Each bus has a card sensor at the doors, it is easy to spot so just tap your EZ link right after boarding the bus and tap it again before alighting. Train stations have barriers with card sensors which you’ll have to go through before you can enter the waiting area. You can buy sim cards at any 7-Eleven store, you just need to present your passport and indicate the amount and/or internet data you want to buy. Singapore is considered one of the, if not the most, expensive cities in the world. Accommodations can definitely take up a major cut in your budget. Luckily, there are now several 2-star hotels and hostels for solo travelers. If you are going as a family, then I discourage taking on hostels since you’ll be sharing with other people. It’s basically a dorm glammed up. 2-star hotels, however, can be as cheap as hostels and still have your needed privacy. 2-star hotels like The Fragrance Hotel is a what-you-paid-for-is-what-you-get type. The rooms are small but given the fact that you’re out and about all day long, this shouldn’t really be an issue. They’re still a decent place to sleep and bathe. If you are traveling by two’s, then it shouldn’t be a problem. A room for two can be relatively cheap whichever type you go to. High end hotels can even have packages for you. It’s the groups and families that need to research a lot before choosing one. The boys and I lining up for Bus 138. Me, seriously contemplating about Bus 138. I kid. I looked so mad though. You can read more about Singapore Zoo in my post here. 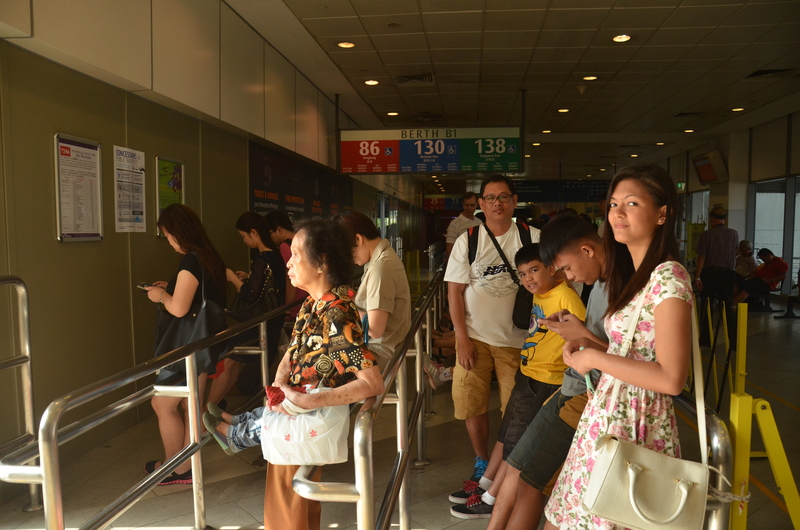 To go to the island, you can either take the Sentosa Express train at the Sentosa Station located at the 3rd level of VivoCity (first train 7:00 am; last train 12:00 mn) or take the cable car from HarbourFront Tower Two (opens 8:45 am – 10:00 pm daily). The Sentosa Express route is much cheaper because you only need to pay for the island admission fee. You can refer to this map in getting to and around Sentosa Island. There are a lot of attractions in Sentosa Island, but you can only do so much in one day. So choose wisely unless you want to spend two or more days in Sentosa, then the world is your oyster, innit? If you are up for the adrenaline rush, then don’t miss out on Universal Studios. But if you’re more on the viewing side and does not like too much heat which the Universal Studios can guarantee, then you can visit their indoor attractions like S.E.A. Aquarium which is right across USS, or the Trick Eye Museum for fun illusions. As well as the Adventure Cove and Marine Life Park for the mermaid-like. There are certain combinations and discounted packages which you can buy here. You can read more about Sentosa Island in my post here. This is a brief city tour, I’m sure there’s lots more to see around Singapore but if you’re tight on schedule then these are the major ones to go to. First off, the Marina Bay Sands Observation Deck is beyond wonderful unless you’re afraid of heights. Only guests can now visit their famous infinity pool so the observation deck is the highest the general public can visit. If you choose to do this, I suggest that you skip the Singapore Flyer since it’s much much shorter than the Sands SkyPark observation deck. They are also in the same vicinity, so what you see from the Singapore Flyer, you’d most likely see from the observation deck plus more of Singapore. Tickets to the Sands SkyPark is 23 SGD for adults. You can just walk around the Gardens and have an amazing nature walk. I also recommend eating delicious chicken & pork satay in Satay by the Bay. Satay by the Bay is a non-aircon food court which is comprised of various food stalls selling different kind of dishes but with satay as the most common in all of the food stalls. They’re quite cheap as well! If you are a major nature lover then you’ll definitely love these two. Walking around Singapore can be quite exhausting. It is very hot and humid during summer so to take a break from the heat, visit these massive air conditioned conservatories. Appreciate different kinds of flowers and plants and learn about them. We were in so much awe when we learned that the Gardens by the Bay weren’t designed ‘just because’. The design of the Gardens has more purpose and you can learn all about that in Cloud Forest. The amount of effort and idea that went in these massive nature-loving attractions is incomparable. You’ll definitely leave with much more love for Mother Earth. Merlion Park is right across Marina Bay Sands, if you’re too tired walking around then you can just quickly take the taxi. There are lots of food shops in Merlion Park but since we’re tourist-spot-hopping, taking a picture with the Merlion can take you about 5 minutes. You can take Bus 193 from Merlion Park to Clarke Quay. Clarke Quay is a historical riverside in Singapore and you can take riverside cruises as well as enjoy the shops that surround the area. However, I would recommend SongFa Bak Kut Teh which is just across Clarke Quay Central mall. The place has existed since 1969 and serves delicious bone meat soup and is considered a major go-to places for Singapore’s food scene. These two places are in different area as well as different genre. If you like to buy cheap deals and Singapore trinkets then you can experience this in Bugis Junction. 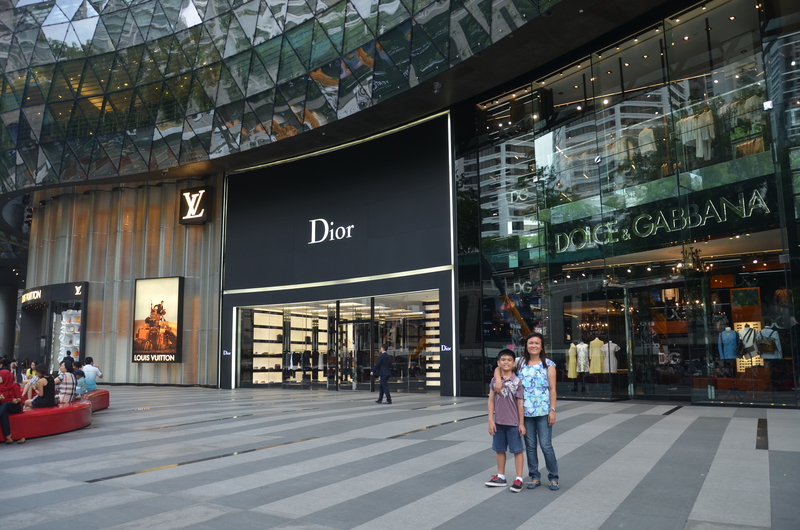 If you’re after high-end shopping, ION Orchard and Wisma Atria in Orchard Road are the places you need to get to. There is also Lucky Plaza and other non-high-end places in Orchard Road so if you want to just have a one-stop type of shopping, Orchard Road can cater all of your needs. If you have more time, I suggest discovering Little India and Chinatown. I hope that was comprehensive enough for you! I wish you an enjoyable Singapore trip! Don’t eat gum and spit anywhere! ***Disclaimer: My How To Survive blog series is intended for quick visits only. I will not be discussing any visa processing or any immigration matters. Please be reminded that these tips are suggestions proven by me and my preferences only; what may work for me, may not work for you. This is not a declaration of musts and needs but merely a guide and hopefully give you an idea where to start. If you are from the future, please consider the date this post was written and verify if any of the mentioned tips are still applicable. Change is inevitable and this post may not be significant years from now. Enjoy surviving <insert place name>!